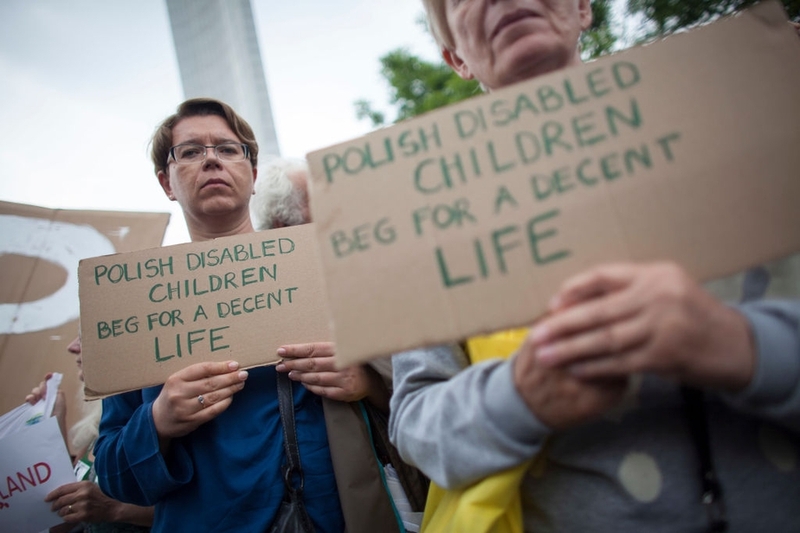 In April 2018, parents of children with disabilities in Poland held protests demanding an increase in disability benefits provided by the state. The protestors occupied the Polish Sejm (parliament) but authorities allegedly hid them behind a thick, grey curtain in order to reduce the visibility of their protest. During the protest, the children's physiotherapists were denied entry into the Parliament building as were other parents who gathered outside in the streets with their children. Dorota Głowacka, lawyer at the Helsinki Foundation for Human Rights (Poland) told the CIVICUS Monitor, that the authorities' response to the protest was very disturbing. The protesters had to endure very difficult conditions and were often subject to mistreatment and smear campaigns. Protestors subsequently called off the protest on 27th May, fearing for their children's health after living in a corridor of the Parliament building with access to one bathroom for forty days . Related to the protest by parents of disabled children, Głowacka noted that access to the Parliament building was heavily restricted, including for journalists using one-time entry cards who could not enter the parliamentary premises for several weeks. As a consequence media had limited ability to cover the ongoing protest but were also not able to, for example, participate in parliamentary committees and provide first-hand information to the public at the time. She emphasised that journalists’ ability to report freely on parliamentary proceedings, actions of elected representatives and other events in parliament is an essential element of exercising freedom of expression and fulfilling “public watchdog” role by media. It also means that the public can be fully informed about the issues which are matters of highest public concern. Any restriction on the access of media to parliament should be thoroughly justified and based on fair and transparent procedures. In a separate development, a Polish satire journalist Antoni Szpak, was indicted in May on a charge of “insulting the Polish nation” in a column published in December 2017. The column criticised links between the Polish authorities and the Catholic Church and mocked politicians relationships to church officials. If found guilty, Szpak could face up to three years in prison. International Press Institute (IPI) Deputy Director Scott Griffen told ipi.media that the prosecution of Szpak violated international standards on freedom of expression. In late March 2018, the Ministry of the Interior and Administration (MSWiA) abandoned its plans to amend the Public Collections Act after NGOs, backed by a citizen appeal signed by 112,000 people, protested the move. The proposed amendment was intended to prevent fundraising efforts such as the one organised by the Pride and Modernity association (Duma i Nowoczesność) to collect donations for a convicted murderer, that was considered to be contrary to public policy. The amendment, framed in ambiguous and broadly language, would have given officials broad discretion and the ability to arbitrarily decide which causes were in the public interest and could therefore be supported by public donations.